Welcome to a neighborhood designed for people and nature. Deerpath Farm’s thriving landscape serves as a habitat for many native plants and animals, and provides a beautiful place for you to make a home. What is a conservation community? Residential conservation developments such as Deerpath Farm integrate the natural landscape with roads, homesites, and housing as much as possible. This close interdependence brings a special opportunity and responsibility to those who live in a conservation community. Conservation or “green” development has gained national attention in the past decades as builders, realtors, and local officials have created development opportunities which preserve the local environment. What are the benefits of living here? Conservation development allows you to live in harmony with Nature. Many other types of planned communities relegate Nature to unused or undesireable areas, or banish it from the property entirely. In contrast, a conservation development brings Nature to your doorstep, so you can experience and enjoy the environment in each changing season. At Deerpath Farm, a native landscape surrounds each homesite, and fills the 140 acre Preserve, with trails leading through wetlands, woodlands and prairies. With Nature so close, every day brings something new to see and do. Deerpath Farm has gone to great lengths to restore the structure and functions of our local natural areas. Their continuing health and flourishment depend greatly on the care you give this land, including your own home grounds. The land preservation techniques used at Deerpath Farm include conservation easements, landscape buffer easements, and roadway right-of-way. About 140 acres of the 200-acre farm are legally preserved under a permanent conservation easement. This means that these lands can never be developed but must instead be maintained in their natural state. Portions of the residental lots also are under conservation easements which protect local views and landscape resources. The Lake Forest Open Lands Association holds the conservation easements, and as the preserve manager, is also responsible for their protection and care. Landscape buffer easements are found on all homesites along the main roadway, and extend back into the homesites from the road right-of-way. They are indicated on each lot’s site plan. Landscape buffer easements were created to help each homeowner maintain a private, natural screen between the house and the public street. The homeowner is responsible for the maintenance of these natural areas as outlined in the Deerpath Farm covenants. The roadway right-of-way includes the 25 feet on either side of the paved street. This area is restored and maintained in a natural condition once construction on a homesite has been completed. The Homeowner’s Association funds this work, which is done under the direction of Lake Forest Open Lands. Deerpath Farm was designed to preserve and foster the natural environment. The placement of the homesites and their building envelopes have been carefully planned to minimize the impact on the surrounding woodlands and meadows, while optimizing views and privacy for homeowners. Lawn areas are limited to the interior of the building envelope, and lawn chemicals and fertilizers are discouraged. Underground sprinkling systems are strongly discouraged and/or not allowed. For more information, see Homeowner Challenges and Solutions (below). Homeowners play a very important role in Deerpath Farm’s beauty and ecological success. Some of the greatest threats to our natural areas arise from everyday home and garden activities that seem innocuous, but are actually very damaging. By understanding these challenges, we can avoid harmful actions, and choose healthier, effective solutions. 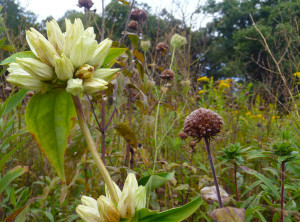 Many of the native plants at Deerpath Farm are extremely sensitive to moisture changes in the soil. This is particularly true of the many oaks that make up the backbone of the community’s forest. When a house is built in the forest, there is always the challenge of increased water runoff from roofs, driveways, and other impervious surfaces. At Deerpath Farm, the runoff is channeled and managed as best as possible during the design process, with the goal of supporting the health of oaks and other native plants with an optimal environment. Rain gardens provide a healthy way to deal with runoff. Rain gardens are small areas on each lot where water runoff is concentrated to allow it to percolate back into the ground. The garden is planted with native wetland and prairie followers and grasses. Rain gardens provide food and shelter for many birds, butterflies and other helpful insects — such as those that eat mosquitoes! Traditional lawn irrigation systems can cause water overload problems over large areas. This saturation is difficult to notice and, unlike natural weather events such as rain or thunderstorms, continues throughout the entire growing season. Over time, this saturation can lead to tree decline and death. Therefore the use of irrigation systems is strongly discouraged and/or not allowed at Deerpath Farm. Native plants can also be damaged by traditional lawn chemicals, particularly the weed killers used on dandelions and other broad leaf plants. These chemicals may affect oaks and other native trees because their roots feed very close to the ground surface.Lawn fertilizer can also cause problems. It promotes lush lawn growth, which directly competes with native tree roots for water and nutrients, in effect helping to starve the trees. Its powerful concentrations may run off the lawn, upsetting nutrient balances in natural areas. The primary components of lawn fertilizers are nitrogen and phosphorous, both of which promote the growth of undesirable and non-native vegetation, particularly in wetlands and streams where the fertilizer dissolves in water. Deerpath Farm promotes the use of native and non-native grasses which are adaptable to the existing Deerpath Farm environment, and which thrive with little to no fertilizer. Smaller lawns are easier to maintain and manage without the use of chemicals and irrigation systems. Hand-weeding and hand-watering are practical solutions for a smaller lawn. 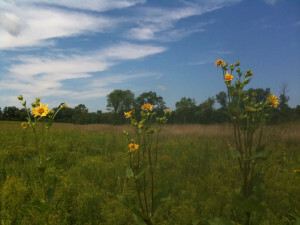 Deerpath Farm encourages the use of native wildflowers and shrubs in areas traditionally converted to lawn. This reduces the amount of required maintenance, and helps create a healthy eco-systems with additional habitat for birds and wildlife. Car-care substances can be damaging to a native environment. Washing a car at home may seem harmless, but the detergents are usually high in phosphorous, similar to a load of laundry. Laundry water goes into a sanitary sewer and is drained off-site, but car wash waste water runs directly off the driveway and street into into local wetlands, which disrupts the eco-system’s proper nutrient balance. Road/driveway salts and de-icers cause similar problems, as they all wash directly into local streams and wetlands and disrupt plant life. Deerpath Farm recommends washing the car at a car wash, where the runoff water is properly drained. Deerpath Farm recommends the use of sand or non-chloride de-icers which have a minimal impact on the eco-system. Certain plants can also disrupt the native environment at Deerpath Farm by mutiplying rapidly and crowding out native species. Some of these “bad guys” are widely-recognized as pests, such as European buckthorn and purple loosestrife, two European plants which have over-run our local landscape. Other plants may not be used at Deerpath Farm, despite their common use in traditional landscaping. For example, the Norway maple can cause problems, as its prolific seeds can easily germinate in the Deerpath Farm forests. The dense shade of this tree can kill desirable native species. It’s possible to create a wide variety of beautiful landscapes with native plants and compatible non-native plants. Native plants require much less maintenance over the long-run, too, as they are naturally perfectly adapted to our climate and environment. The Deerpath Farm covenants specifically prohibit the planting of certain grasses, flowers, shrubs and trees which can harm the local environment. If invasive species exist on a homesite, Deerpath Farm requires their removal of these species. Removing these plants will help your overall landscape thrive and can also increase its beauty. Planning your landscape at Deerpath Farm is an exciting process on par with planning your house. Today, many architects and landscape design/build firms understand the benefits of working with native plants, and how to achieve various effects with them. What are your goals for your yard, and how do you plan to use it? You may wish to have lots of flowers, or a place to sit and enjoy the larger vistas. You might choose a fully native landscape that echoes Deerpath Farm’s conservation areas, a mixed garden with paths and specific plantings, or a turf area with room for a playset, or lawn sports such as croquet or frisbee. Deerpath Farm encourages homeowners to consider conservation-friendly landscape features such as bird feeding stations, butterfly and wildflower gardens, rock gardens, firewood storage places, and recycling areas for gardening compost. Lastly, learn how to recognize unwanted plants such as garlic mustard, buckthorn, Japanese Rose, and canary reed grass, and take measures to keep your property free of them. Before the Deerpath Farm community was created, many species of wildlife used the land. These animals continue to live in Deerpath Farm because of the conservation design and efforts, and new ones will come too. The way you landscape your yard will attract and assist desirable native wildlife. Did you know that a traditional turf lawn on a one-acre property may contain 20-40 different kinds of plants, whereas a native oak savanna/prairie the same size may have up to 300 different plants, including mosses, lichen, and ferns? The native landscape offers much more food and shelter to the wildlife that depend on it. More information about building and landscaping at Deerpath Farm is available in the Deerpath Farm Pattern Book, and the Deerpath Farm Covenants. The Pattern Book is a guide for architects and builders which details ideas and principles for successful design. The Covenants further promote this approach in specific legal detail. Deerpath Farm welcomes your inquiries and questions.